Do you think pesticides on your fruit and vegetables don’t matter? Actually, small changes make a big difference. 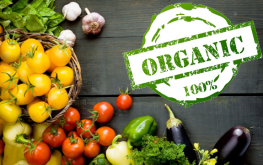 In a new study published in the Journal of Environmental Research, it was found that participants who ate an 80% organic diet had 89% less pesticide residue in their urine compared to eating conventionally grown produce. Lower levels of dialkylphosphates (DAPs), a non-selective organophosphate metabolite, was found after only a week long change in diet in this most recent study. Participants who ate a conventional diet (full of pesticide-riddled, GMO foods) had high levels of DAPs, and those who consumed organic food enjoyed a much lower level of this one marker for toxicity. The study, titled “Reduction in urinary organophosphate pesticide metabolites in adults after a week-long organic diet,” proves that we need to promote organic agriculture and ditch the Big Ag ‘science’ that has promised us a better food supply, but which has only caused a wide array of diseases. They’ve been catalogued, in fact, by Beyond Pesticides in an attempt to show the epidemic proportions of this problem. The study used non-smoking participants between the ages of 18 – 65 – more proof that pesticides affect all of us, no matter our age. The pesticide levels found in the urine of the participants who ate the conventional diet are representative of the general public – who consume foods that deliver health consequences they might not fully comprehend. Organophosphates have been used for quite a while, but their prominence in modern agriculture has become profound. Originally utilized in World War II nerve gas agents, over 73 million pounds of organophosphates were used on U.S. crops in 2001, as admitted by the National Centers for Disease Control and Prevention (CDC). Numbers for the amount used in the last decade can only assume a compounding of this incredible level of use. The truth is that organophospahtes were considered a form of chemical warfare – and they still are. Organophosphates inhibit cholinesterase, a neurotransmitter that carries signals between nerves and muscles. It can cause paralysis. Children are at an elevated risk of cholinesterase poisoning since their bodies cannot detox from pesticides and other chemicals as easily as an adult can. There are many reasons to support organic globally. Pesticide use is just one important factor.